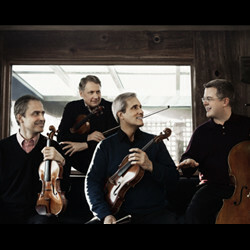 The Emerson String Quartet stands apart in the history of string quartets with over four decades of an unparalleled list of achievements: more than thirty acclaimed recordings, nine Grammys® (including two for Best Classical Album), three Gramophone Awards, the Avery Fisher Prize, Musical America’s "Ensemble of the Year", and collaborations with many of the greatest artists of our time. With a repertoire that spans three centuries of chamber music, the Emerson also looks towards the future by collaborating with today’s most esteemed composers and premiering new works, thus proving their commitment to keeping the art form of the string quartet alive and more relevant than ever. The coming season reflects all aspects of the Emerson’s venerable artistry with high-profile projects, collaborations and tours. In season 2018-2019, the Emerson continues its series at the Smithsonian Institution in Washington, DC for its 40th season, collaborates with pianist Shai Wosner in New York at Alice Tully Hall, and appears at University of Georgia as part of the Chamber Music Society of Lincoln Center's On Tour Series, Friends of Chamber Music in Denver and Vancouver, Library of Congress and Meany Center for the Performing Arts, among others.